Take a look at the map to make sure you know about a few location changes this year! Will there be a carnival this year? 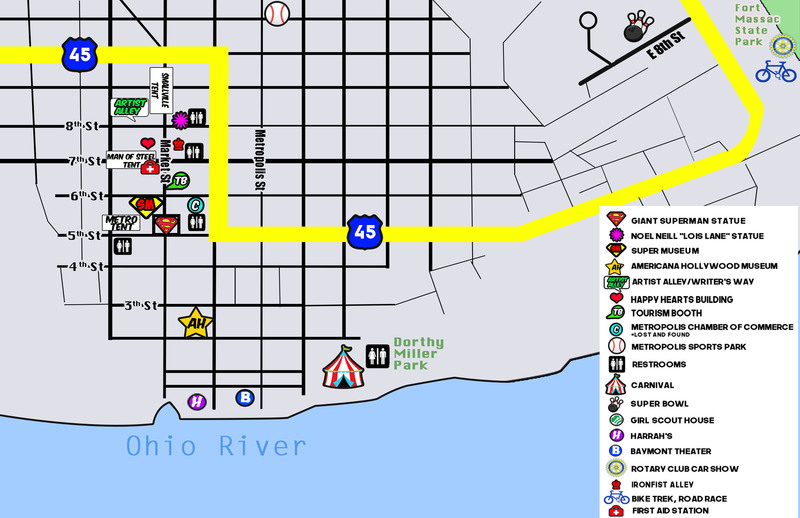 Yes, there is a carnival this year and it will be held near Dorothy Miller Park by the Ohio River. Ticket information will be released soon. The Carnival opens at 5 pm on Thursday & Friday, & 12 PM on Saturday. Is there a fee to attend the Superman Celebration? NO! The Celebration itself is a free event. There are some events within the event that serve as fundraisers or are special events where a cost is applied to attend but to simply attend the event there is no cost. Cash or Credit Cards accepted at the event? Cash is always welcome! Please be sure to note the location of ATM’s at LEGENCE BANK (522 Market Street), BANTERRA BANK (521 Ferry Street) and CITY NATIONAL BANK (423 Ferry Street). Some vendors, artists, writers and merchants do accept credit cards. The Metropolis Chamber of Commerce Souvenir Store accepts ALL major credit cards & cash. (Please note there is a $5 minimum purchase for all credit card transactions) No checks accepted. Will there be helicopter rides this year? Yes! Superman isn’t the only one that can fly in Metropolis! SAS will operate helicopter rides starting at 4 pm on Thursday, 9:30 AM to Dark on Fri & Sat & Noon to Dark on Sun. The location will be beside the carnival on Front Street. A reservation booth will be located at Superman Square. Rides are $50.00 per person with a min. 2 riders. 2 -3 riders per flight. 15 Min. flight.